Diary of an Aspiring Loser: We're Almost Ready! Miguel and I have been readying the baby room. I read advice somewhere that suggested getting the bulk of the work done before the 3rd trimester so you could relax and focus on the easy details during the last few months. I'm feeling really good that we've done that. We've taken our time too, which is nice. A few months ago we emptied out the nursery-to-be and dealt with selling or donating the contents. Miguel touched up the walls and readied the room for painting. We picked out the furniture and ordered it in early November and it arrived in early December. We painted a few weeks ago, after going through some color decision-making issues. We started out with various shades of blue and ended up with two shades of green. Finally we brought the furniture in from the garage and set it up. Fun, fun, fun. Here are Miguel and I showing off the room. We plan to use the bassinet as the little man's nap spot during the day in the living room. Here's one of me in the glider. I put a diaper on that little bear and he's been our stand in baby ever since. Miguel has worked so hard, seeing this picture reminds me that we used to have curtains up for closet doors and he painted and installed those new white wood doors. You can't really tell in these pictures but the lower part of the walls are sage green and the top part is a lighter green. I love it, it looks gorgeous with the dark wood. So we have a ton more stuff to get, mainly clothes, bottles, diapers, a high chair, a stroller, carseats...the list seems to be never ending. Oh, and I would love to get some books, like Dr. Seuss and some baby books or whatever. I know you don't really need some of these things but.... Whenever I go in and look at this room I'm filled with gratitude at how fortunate I feel. Fortunate to be having a little baby, fortunate to be able to prepare a space for him, fortunate to be warm and safe with a loving husband and family. So many people in the world have so little. We're not rich, and yet we are as rich as I could hope for. Change of subject... I've had a secret fear creeping up on me as I've watched my thighs get bigger and how out-of-habit I am when it comes to exercise and counting points/calories, etc. I found myself wondering the other day, "How will I get back to where I was?". Then I stopped myself and made the same deal I made when I first started on this journey back in February of '07, all I need to do is get back to meetings. I don't have to get on my bike and ride 50 miles, I don't have to run out the door for a 45 minute jog, I don't have to stick to my allotted points all day every day. I just need to go to meetings. The rest will fall into place. And I know I can make it to meetings. Realizing I will start at the beginning and not have to suddenly be back near the finish line eased that creeping feeling of dread. I can't tell you how much I weigh right now because I don't know. I'm only weighing at doctor's appointments. But here's a pic I took yesterday of me at 30 weeks pregnant. I feel like my belly is so much bigger than it looks. And with 10-12 weeks to go I get nervous thinking about just how big it will get! The room looks great! And don't forget you'll have all your friends on here to help support you when you return to your journey. I bet you'll be right back into things sooner than you think!! I'm so happy for you guys!!! Have you picked a name yet? You look so great. Congrats on everything, and I hope the next trimester goes just as smoothly! You look fantastic. Pregnancy suits you. You are right, everthing will fall into place. Don't worry about the weight right now. Congratulations. This is such an exciting time. Your room looks great. I love the room and you look great! Getting prepared for a baby can be so time consuming, but it is exciting too! Congratulations! I am soooooo happy for you and your husband. The nursery looks so inviting and happy with the two of you standing there. Enjoy the rest of your pregnancy, and the weight loss afterwards will come when it is time. Can't wait to hear more in the following weeks! You look absolutely wonderful, and happy! 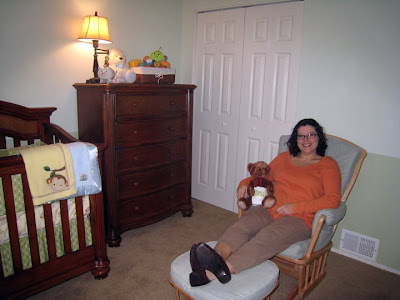 the babys room looks great and so do you! Unfortunately having babies is not good for the figure for ANYBODY, but when you've worked so hard to lose it, it is hard to let go of the idea that you might never get back to where you were. You will - when you are ready! But given all that blabby crap I just said, YOU STILL LOOK DAMN GOOD TO ME! You are the cutest pregger girl EVAH! Thanks for posting the photos. I love the sage green walls with the furniture. It looks fabulous. Can you still see your feet when you look down? It looks like you can. I remember when I couldn't see my feet anymore. It was like a benchmark or something. LOL! You look fantasatic and so does the nursery. These are very exciting times! Enjoy them! It's wonderful to see how well you and the house are coming along. And I love that you recognize how fortunate you are. So many budding parents don't! You and the room look incredible - You do have that Mama to be glow!! Happy New Year! I LOVE the room. You and Miguel did an great job. Looks very classy and peaceful! !I can't wait to see pics of him once he is here. Don't sweat the weight gain. You have all the skills and knowledge to take it off. Besides we will be right here waiting to cheer you on when you do!!! You are the cutest pregnant lady ever! I can't wait to see pictures of your little cutie pie! The room looks fabulous and you look spectacular! Don't worry about the weight at all....it's all good! In the meantime, enjoy being pregnant! Darling, you are all baby. You are thin everywhere else! I think you look radiant and so pretty! That room is so nicely done. Very calming colors. Perfect to encourage a baby to sleeeeeeeeeep. You are looking so cute! and good! It must seem like it's comming up so fast, yet so slow at the same time. You'll do great, just look at all you've acomplished, child birth will be a cinch!! As for books...I'd recommend one or 2 on sleeping and creating good sleeping habits right from the begining! One I found I liked and used was Sleep Sence (bough as an online book) and Solve your childs sleep problems by Richard Ferber. Prevention is the best medicine. Though it all of course comes down to your little man and what HE wants to do...but if you have some thoughts/ideas in your head then it might be easier. As you can maybe tell sleep has been the biggest parenting issue (well besides potty training right now, but I CAN'T get in to that with out having a nervouse breakdown). So excited for you guys! The nursery is beautiful and you look fabulous!!! Cute, cute theme for the nursery, and you look great. Enjoy the next several weeks and don't sweat the small stuff...pounds will come off in due time. I filled my kids' rooms with books since day one, and they both LOVE to read still (10 and 7). Make it part of the routine, and your boy will love books too! The room looks so awesome. I'm getting pretty jealous!!! And you look so wonderful just amazing!! You'll have no problems at all getting back and I think your approach is dead on - one step at a time!! You look fabulous, Michelle! The weight will come off, don't worry about that. Great job on the room, you two! It looks so relaxing. I love the monkies! You need a little table next to your glider to hold drinks and books for you, and whatever for babykins. I can't wait! I am so excited!!! The nursery looks great, and so do you! Your attitude is dead on, as well.....it'll all fall back in place after you have the baby and get back to meetings. So enjoy yourself now! The weight thing will get in line when the time is right--you've proven your athletic ability and you can get back to that super-fit point again when you're ready. You look great and so does the baby's new room. And don't worry about post baby trim down. You did so amazingly before, you have the tools now to do it all again. AND a love for the bike. So happy for you Michelle! 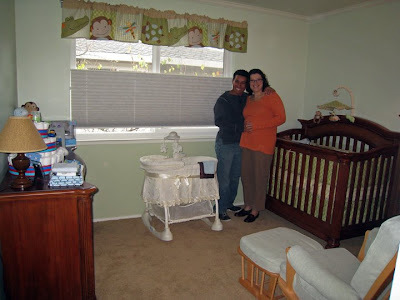 You look beautiful in these pictures and the nursery looks GREAT! Hope you are well. I love seeing pics of your cute belly! Hi Michelle! You must be getting even closer to the time now. I wanted to drop by and mention that I updated today with a big of baby news myself! 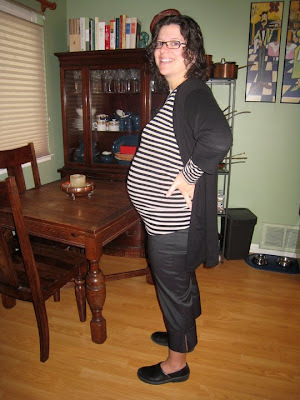 I hope you are doing well and enjoying the quiet before the baby comes! Look at that nursery!!! How adorable. You look amazing, don't worry about the gain...just remind yourself of that healthy beautiful baby boy! You will burn it all of running him around anyway! Almost at the home stretch! I hope you're all doing well! OOOHHH, I'm getting excited to see the little man. I'm sure your are a busy bee right now. Just think how many miles the little guys is going to have under his belt before he is a year old (oh wait, babys don't wear belts - ah you know). Don't forget a super cute jogging stroller and a cart to tow behind your bike. I would be a terrible mom, I would buy all of the fun stuff and forget diapers and bottles and stuff. Anyway - I hope the bun is cooking away in the oven. Almost there! I love the baby's room. Just so cute. Can't wait to see pictures of him when he arrives. getting close now! Hope all is well Michelle!